Now in its third year, I’d like to announce SantaThing! What is SantaThing, you ask? SantaThing is Secret Santa for LibraryThing members. The idea is simple. Pay $25. You play Santa to a random LibraryThing member, and find them up $20 worth of books, based on their library or a short description. Someone else does the same for you. LibraryThing orders the books and pays the shipping, and you get the joy of giving AND receiving! You can sign up for yourself, but you can also buy in for anyone else–LibraryThing member or not. 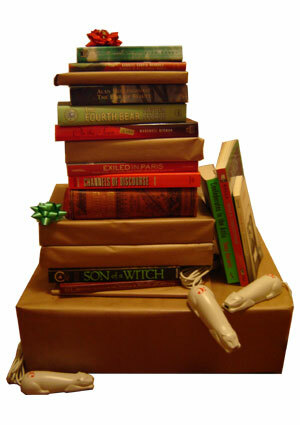 If the person doesn’t have a LibraryThing account, make sure to mention what kinds of books they’d like, so their Secret Santa can choose wisely. This year, we’re offering you the option of some independent (and for some people local) booksellers, and WAY more countries can participate (see the full list). For the first and second annual SantaThings, we used Amazon as our bookseller, and registration was limited to those living in the US, UK, and Canada. This is a huge new experiment, so please be understanding. We’re trying to make SantaThing inclusive for other booksellers, with the hopes that next year we can throw the doors wide open. In the United States, you can choose between Powell’s (Portland, OR), Harvard Book Store (Cambridge, MA), The Book Table (Oak Park, IL), and Amazon.com. In Canada, your choices are Chapters Indigo, The Book Depository and Amazon.ca. In the UK, you get The Book Depository or Amazon.co.uk. All other countries get to use The Book Depository. The sign-up will close Tuesday, December 1st at 4pm Eastern time. Once the sign-up closes, you’ll be able to use the same page to pick for your Santa. Picking closes Friday, December 12th at 10pm Eastern time. Once the picking ends, the ordering begins, and we’ll get all the books out to you as soon as we can. There’s no guarantee that we’ll have books out by December 25th, but we’re going to try our darnedest. I did SantaThing a couple of years ago- can't do it this year, but you all should! It's so fun and I got a great book. I'm glad LT is continuing with the tradition. The Book Table?? Where are they located? Physically located in Oak Park, Illinois. The SantaThing seems to be so exciting! I'm so happy LT is doing this again! I love being a book Santa! What a cool idea! I can't afford it this year so hopefully they'll continue with it next year. Thanks for your post.Santa thing is really wonderful.Its really fun and enjoyment.